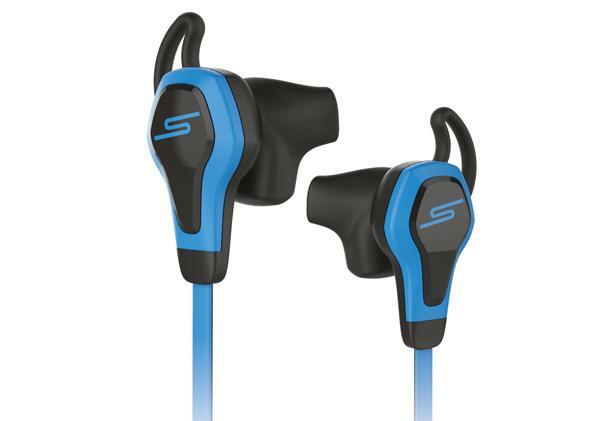 Intel and 50 Cent's audio company SMS Audio partner on earbuds with biometric sensors. SMS Audio BioSport In-Ear Headphones powered by Intel. Catchy name. Intel processors are everywhere, but the company isn’t exactly known for lifestyle products. Meanwhile, 50 Cent’s company SMS Audio isn’t known for its tech. Bring the two together, though, and what do you have? Well … another awkward corporate partnership. The two groups are joining forces to launch earbuds that do biometric tracking and are geared toward fitness. The idea is to reduce the number of gadgets users carry around instead of adding to them with a smartwatch or other wearable. The headphones are wired and draw power through the standard 3.5mm headphone jack to keep the sensors up and running without charging. They measure heart rate and sync to a smartphone app. The price hasn’t been announced yet, but other SMS Audio earbuds currently cost between $79 and $399 (unless they’re on sale). The concept is pretty clever. The headphones use accelerometers to make sure the heart rate data collected by the optical sensor isn’t thrown off by exercise motion, and the app can even choose the songs that come on over the headphones by matching tempos to the user’s heart rate. “The wearable technology collaboration between SMS Audio and Intel elevates our capability to bring smart exercise to consumers,” Brian M. Nohe, the president of SMS Audio, said in a press release. The Wall Street Journal reports that there isn’t an Intel chip inside the earbuds, but that the company did much of the product engineering and software design. Don’t worry, guys, Carmelo Anthony is an investor in SMS Audio. This is gonna be fine.